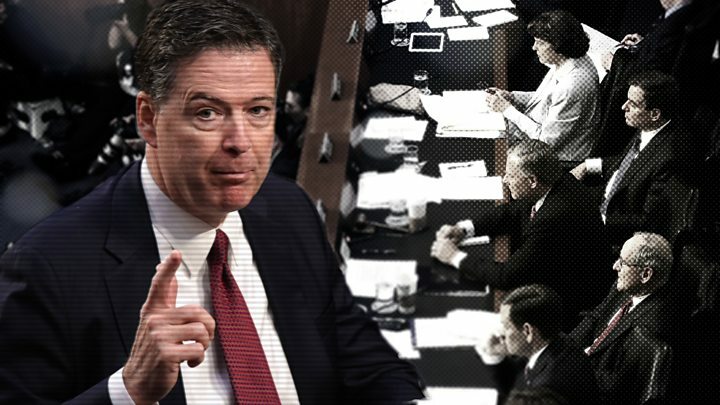 Who said what during a series of one-on-one conversations between President Donald Trump and then-FBI head James Comey, before he was fired, is one of Washington's most hotly debated topics. Up until now we've only had media leaks to go on, plus denials from the White House. But on 8 June Mr Comey went on the record before the Senate Intelligence Committee. His prepared statement, released on a day earlier, put a sharper focus on discrepancies between his account of his meetings with President Trump and the White House version. They have both accused each other of lying. Mr Comey testified to say he felt Mr Trump had told "lies, plain and simple" and he feared he would have done so again. Afterwards Mr Trump tweeted that the testimony was filled with "false statements and lies". What Mr Trump said: "The Democrats made up and pushed the Russian story as an excuse for running a terrible campaign," he tweeted in March. What Comey said at the hearing: "There should be no fuzz in this whatsoever. The Russians interfered in the election." What Russia said: President Vladimir Putin has repeatedly denied the accusations. What Mr Trump said: "James Comey better hope that there are no 'tapes' of our conversations before he starts leaking to the press!" the president tweeted in May. What Mr Comey said at the hearing: "Lordy, I hope there are tapes!" He also said that it did not occur to him at the time that there might be a recording, so he shared a memo about their meeting with a friend, thought to be law professor Daniel Richman, so it could be shared with the press. Media captionComey: "Lordy I hope there are tapes"
What Mr Comey's statement says: "The president said, 'I need loyalty, I expect loyalty.' I didn't move, speak, or change my facial expression in any way during the awkward silence that followed. We simply looked at each other in silence." What Mr Comey added at the hearing: Mr Comey said he believed Mr Trump was trying to build a relationship of loyalty when asking him to stay on as director at their January dinner. What Mr Trump says: He was asked in a Fox News interview on 12 May if he had asked Mr Comey for loyalty, and responded: "No, I didn't, but I don't think it would be a bad question to ask. I think loyalty to the country, loyalty to the US, is important. You know, it depends on how you define loyalty, number one. Number two, I don't know how it got out there because I didn't ask that question." What Mr Comey's statement says: He alleges Mr Trump asked him to drop the investigation into then-National Security Adviser Michael Flynn. "[Trump] said, 'I hope you can see your way clear to letting this go, to letting Flynn go. He is a good guy. I hope you can let this go.' I replied only that 'he is a good guy.'" What Mr Comey added at the hearing: "I understood him to be saying that what he wanted me to do was drop any investigation connected to Flynn's account of his conversations with the Russians," he said. But he does not think Mr Trump asked him to drop the wider Russia investigation. What the White House says: It denies Mr Trump asked for the inquiry to be dropped. After the hearing, the president's lawyer, Marc Kasowitz, said: "The president never suggested that Mr Comey 'let Flynn go'." What the Trump administration said: Mr Trump said he was told by the director "on three separate occasions" that he was not being investigated by the FBI. What Mr Comey's statement says: He backs the president's account: "I discussed with the FBI's leadership team whether I should be prepared to assure President-elect Trump that we were not investigating him personally. That was true; we did not have an open counter-intelligence case on him." Mr Comey says he repeated that assurance in two subsequent meetings. 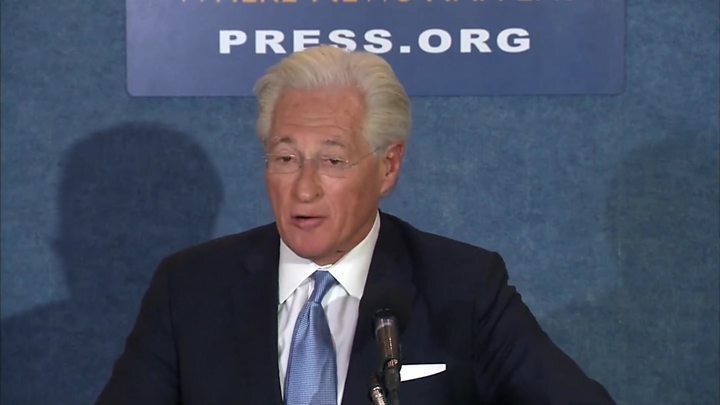 Media captionTrump's lawyer: Mr Trump was not under investigation and never said "let Flynn go"
What Mr Comey added at the hearing: Mr Comey specified that he reassured the president after briefing him on salacious claims that Mr Trump had consorted with prostitutes in a Moscow hotel. The claims were in the so-called Steele dossier - a series of reports about Mr Trump and Russia filed by Christopher Steele, once of Britain's secret intelligence service MI6. Mr Comey said this reassurance was not related to the broader Russia inquiry. What Mr Trump has said since: "Despite so many false statements and lies, total and complete vindication," the president tweeted the day after the hearing. His lawyer said the testimony confirmed that Mr Trump was not under investigation "as part of any probe into Russian interference". What media leaks said: Mr Comey reportedly told Attorney General Jeff Sessions that he did not want to be left alone with the president. What Mr Comey's statement said: "I took the opportunity to implore the attorney general to prevent any future direct communication between the president and me." What Mr Comey said at the hearing: "I was honestly concerned that he [Mr Trump] might lie about the nature of our meeting." 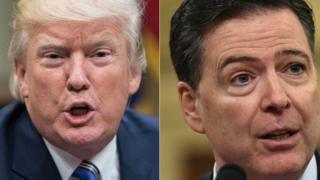 What Mr Trump said: The White House initially said Mr Comey was fired over his handling of the inquiry into an affair relating to Hillary Clinton's emails. But Mr Trump later said "this Russia thing with Trump" was a factor in his decision. 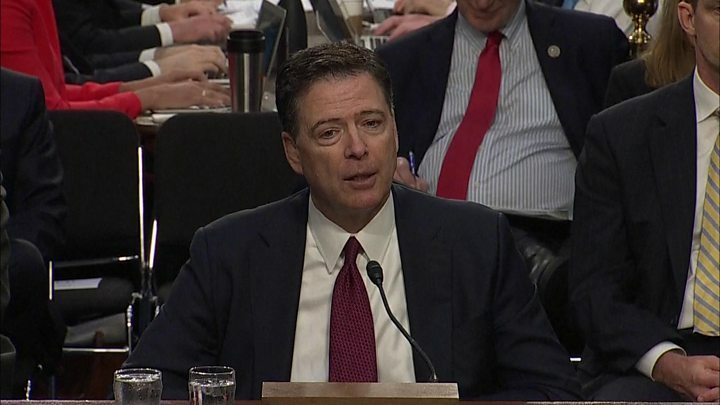 What Mr Comey said at the hearing: "It confused me when I saw on television that the president fired me because of the Russia investigation... That didn't make sense to me," he said. He said the president had defamed him and the FBI by claiming the agency was "poorly led". Mr Comey said: "Those were lies, plain and simple."